If you’re a keen gardener, a small flock of backyard chickens can be a valuable workforce in your yard. And they work for chicken feed! Your chickens will be only too happy to provide you with their excellent organic waste control services. Your lawn clippings, weeds and kitchen waste make a delicious dietary supplement to them. When you prune vegetable plants, pull out plants at the end of the harvest, pick up dropped or damaged fruit, or trim leaves and peel vegetables, just throw it all into the chicken run and watch them go crazy. With such a healthy, varied natural diet, the eggs from your chickens will have brilliant golden yolks and will be packed full of nutrients. You simply can’t buy eggs as good as these! Your chickens probably won’t eat everything that gets thrown into their run. But what’s left will be regularly turned over and manured, and before long it will break down into beautiful dark, rich compost. This type of natural compost is one of the best amendments you can add to your garden beds, and it’s sitting there for the taking. All you have to do is scoop it up when you need it. The leaves you rake from your yard can be added to your chicken house as a bedding material. If you don’t have enough leaves you can use straw, wood shavings or wood chips. At night, chickens expel a surprising amount of manure while they sleep. A high-carbon bedding material helps to neutralize the high-nitrogen manure and eliminate smells. Every so often you will need to rake out the bedding material from the chicken coop. It’s not really a chore, though – think of it as harvesting a high-nutrient garden mulch for free. Or you can add it to your compost pile, where it will break down rapidly due to its good ratio of carbon to nitrogen. 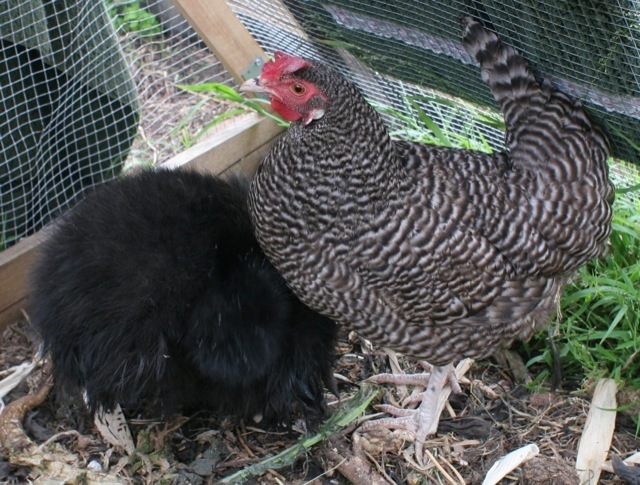 With a little bit of planning, you can let your chickens into your garden beds between crops. They’ll scratch around and eat any weeds or pests they find, turning the soil over and depositing little parcels of manure here there and everywhere. It sure beats digging and dousing with pesticides! And of course, the best part of all this will be the gorgeous fresh eggs you’ll be rewarded with every day. They’ll be a wonderful complement to your delicious home-grown vegetables, allowing you to put together a complete meal from your backyard. Whether it’s omelet, quiche or boiled eggs on salad, there’s nothing more satisfying than knowing you grew every ingredient yourself.